You would think I would be able to keep up with something I’ve had since 1960, but right now I am having a problem locating the item for which I am searching. I know I have had it sometime in the last couple of years, but right now its location eludes me. The item in question is the little blue covered book I received upon my initial attendance of Lee Jr. High – my student handbook. Several years ago I copied a map of the halls and had kept the book near my computer desk, but right now I cannot lay my hands on it. If any of you classmates can help me out and has access to yours, please let me know so I can stop looking. The hall maps above came from the Student Handbook, and shows the two wings on the west of the building. The lunchroom wing (A) was the closest to the front entrance. The little blue book was my instructions to how to be a Lee Jr. High student. It had the basics of daily life, the bell times, the dress code, and a few other things necessary to fit into the society of my new school. I do not recall receiving a similar book at Huntsville Jr. High when I started the seventh grade there. 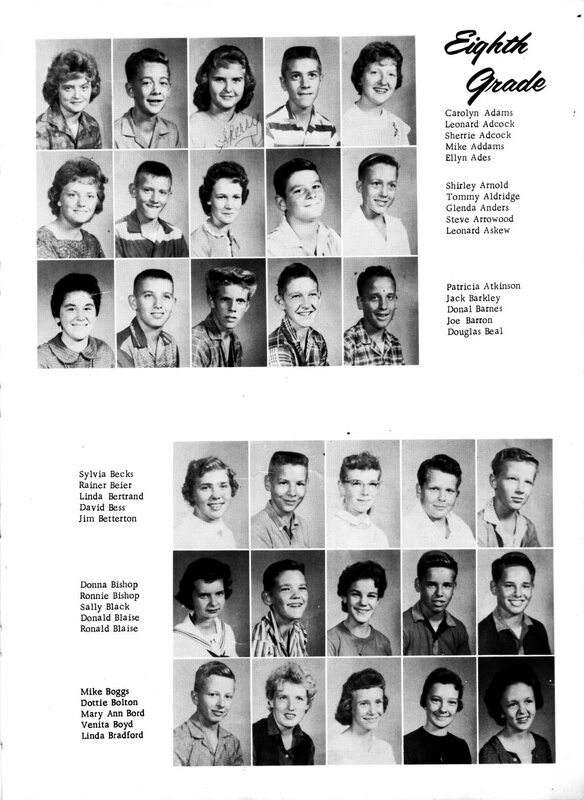 Above is a page from the handbook given out to the class of 1968, a few years later than when I got my student handbook in 1960, but the information is pretty much the same - except for the annual price. We did not have an annual from 1960 until 1964. I note with interest the information on the restricted access to the lockers. The lockers used combination locks to keep them secure, but we soon found a firm upward nudge with the palm of your hand could open them faster than The Fonz could play a jukebox. 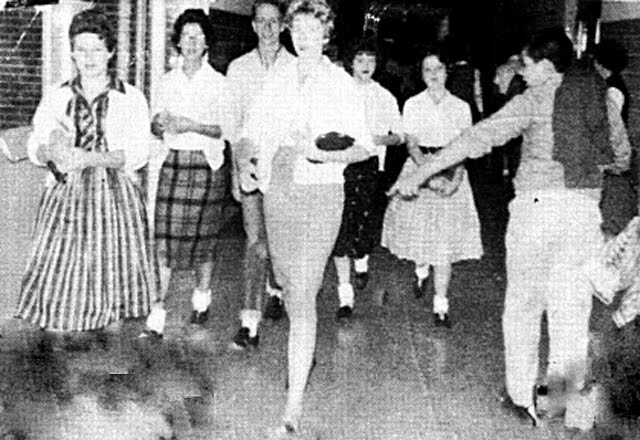 Girls could not wear slacks - photo of walking the halls from 1960 "The General" yearbook. We had five minutes allotted in the schedules to change classes. Do not run in the corridors! 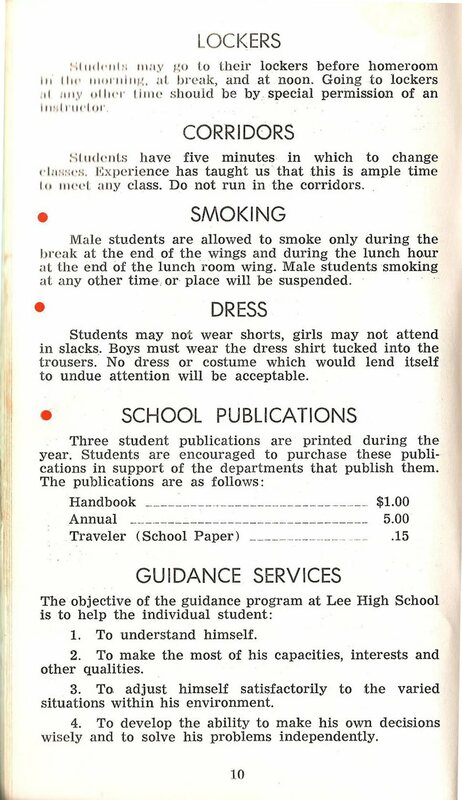 Also, note there was a smoking policy for male students. Girls were not allowed to smoke. The dress code stated no shorts for any students and no slacks for girls. Dress shirts had to be tucked into the trousers. No dress or costume which would lend itself to undue attention was acceptable. I also find it odd the "Guidance Service" does not worry about sexual equality and addresses all the rules to "himself and his" actions. What about "her?" As for the skirts - I was an all-American boy and I preferred tight skirts (the tighter the better) to the long dresses...just my opinion. 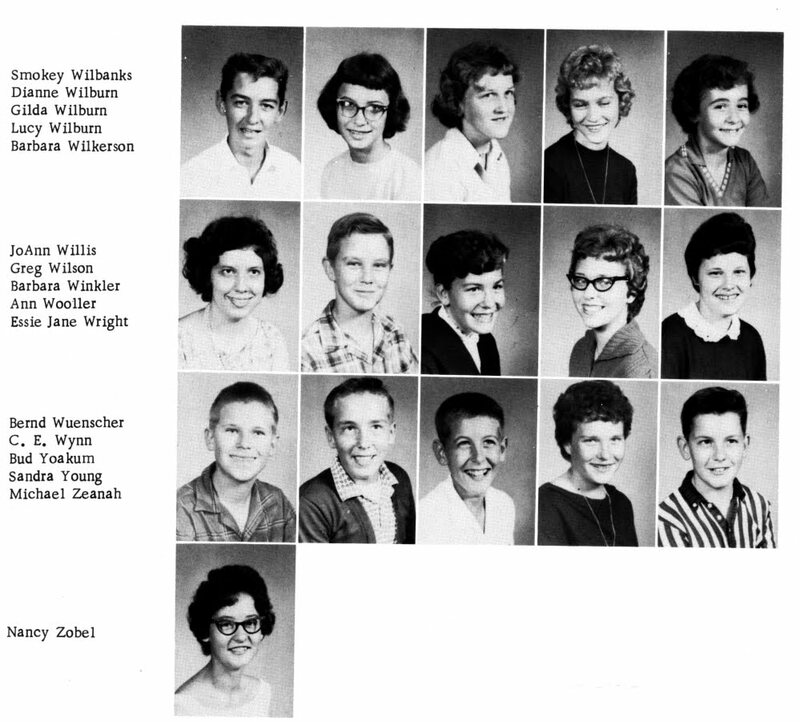 To my best recollection, the academic requirements for ninth grade students were a boiler plate list of core subjects. Everyone took the same basic academic courses and then there were a few choices of electives. According to my report card for that year, I took English, Civics, General Science, and Arithmetic. Bobby Cochran’s report card, which he gave me a copy of many years ago, shows he took Algebra instead of Arithmetic but all our other basic courses were the same. I know there were also several electives including Art, Choral/Music, Band, Shop, Mechanical Drawing, Home Economics, and the one I took - typing. Bobby had one more course than I did by studying art, though I show no other class – but I recall having a period dedicated to study hall which did not show up on my report card. I do not think I would have made it through the year without having a class hour supposedly dedicated to studying. I know I did not study all the time while there, but the majority of my homework was completed at school before I went home. joined in the 9th grade. We had to buy our own books, most of which were purchased at T.T. Terry’s on the square downtown. Books were used for many years and passed down or sold from one class to the next. I also remember the school was very interested in which students had parents who worked on Redstone Arsenal, since there was some kind of government entitlement the school could get for each dependent of a federal employee. So, what was my normal day in the ninth grade? As noted last week, by riding the bus I always got to school early and spent the pre-class time wandering around the halls in circles with my friends and classmates. Sometimes we would stop and sit on the heat registers or on the stairways to the balcony in the auditorium, but most of the time we just walked. I also recall we had several water fountains along our trek to keep from dehydrating during those long periods of activities. I do not recall any particular person or group I did my walking with, so I must believe it was with the group from Carter's Skateland and my Boy Scout troop, and perhaps some of my classmates from my home room. At this point I still had no best friend at Lee. When the bell rang to warn us it was five minutes before classes started we would all scramble back to our home rooms and make our way to our assigned desks. The home room activities consisted of a morning roll call and announcements about upcoming events and activities. I want to think we had two class periods in the mornings with the first one starting around 8:15 am before we had a 15 minute break, which took place around 10:15 am. With the ringing of the break bell, we all headed for the halls to once again take up our routes around the auditorium and visit or flirt as we roamed the halls. The routine continued the entire break period and then we went back for the last morning class. If I remember correctly, we ate lunch in three different shifts. One group would eat first then go on to their class for the entire period. One group would do half their class then have lunch and afterwards return and finish the class. The last group would have their entire class work done before they went to lunch. Each class would march, more or less, down to the lunchroom as a group and return as a group as well after eating. I don’t remember many people bringing their own lunch, but I am sure some did. We paid our lunch money and got our trays and slid them down the food line, where we were rewarded with a meat and three normally. I still remember Friday was always fish day, though I did not have a friend I knew of who was Catholic. The fish meal was always fish sticks, still remembered today when we serve a similar meal to our grandchildren. We sat with whichever friends wherever we wanted and when we were done eating carried our trays over to the corner of the cafeteria and emptied the uneaten food and paper waste into a can and slid the tray, plate and silverware through a window into the hands of some of the lunchroom workers. There were two more class periods after lunch and then the final bell rang freeing us from the confines of the learning institution for the day. I did not participate in any extra curricular activities in the ninth grade, so I did not stay around after school for things such as band practice or any sports team practices. What they did and how much time they devoted to such activities elude me. As soon as the bell rang I went to meet the bus and it transported me back home as I stated last week. I suppose there were times when I missed the bus and walked home, but I do not remember ever getting a ride home with any classmate during that year of school. Since the oldest students in school were only 14, no one had a driver's license yet. I also remember sometime during my time at Lee several of my friends were involved in a program called "DE" which stood for diversified education. It was really an intern type program where people actually had jobs in which they were earning a trade. Hair dressing comes to mind as one of them. The most important life-changing thing to happen to me in the ninth grade was also probably the most important thing to happen to me in my three years of high school which followed. As noted my elective course was typing. I made Bs in all my classes that year except for one – Typing, for which I received/earned a C. I still remember why I did so poorly in typing. It was because I did not do my assigned typing lessons like I was supposed to do. Instead, I used my typing periods to type my homework for the other classes, which helped me (I am sure) earn the Bs and not Cs in those classes. I found it much easier to type reports than to hand write them, so I did. But of all the things I learned as a teenager, typing had the greatest influence on my future than any other skill. 3. What was the slogan for T.T. Terry’s where we bought our textbooks? 4. Does anyone have a copy of the little Student Handbook? 5. Did any of you participate in the diversified education program, and if so, what did it entail? 6. Did you, or anyone you knew, have any issue arise from the "dress code" or smoking policy and if so, what? Memphis, TN - Until bombarded with emails of disapproval, the current topic of our first years at Lee will be continued. 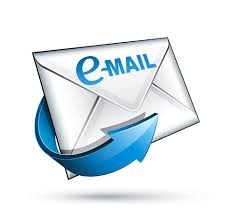 I realize many of our non-Lee readers might not understand some of the issues (such as walking the halls) but perhaps there will be enough generic issues to interest other classes. "Texas John Slaughter" was a black-and-white TV series which aired 17 episodes between 1958 and 1961 as part of "The Wonderful World of Disney", starring Tom Tryon in the title role. The character was based on an actual historical figure, Texas Ranger John Horton Slaughter. Tryon memorably wore an enormous white cowboy hat with the front brim turned up. Most episodes were set in Tucson or Tombstone, in the Arizona Territory. The theme song for the series includes the line: "Texas John Slaughter made 'em do what they oughter, and IF they didn't, they died." The historical Slaughter was born in Louisiana and spent most of his career as a sheriff, state representative and cattleman in Cochise County, in southern Arizona Territory. He earlier served in the Confederate Army and was a Texas Ranger in San Antonio. Some sources indicate that the real Slaughter spent more time playing poker than he did raising cattle or chasing outlaws. A fellow lawman described the short-in-stature Slaughter, when in pursuit of cattle rustlers or horse thieves, as "a spider spinning its web for the unwary fly." A writer called him "the meanest Good Guy who ever lived." John Horton Slaughter died in 1922 at his home in Cochise County, Arizona. The large San Bernadino Ranch, which he created, was declared a National Historic Landmark in 1964. Prior to portraying Texas John Slaughter, Tom Tryon appeared in "I Married a Monster from Outer Space." Later he was part of an all-star cast in the D-Day epic "The Longest Day" (1962) and played the title role in "The Cardinal" (also 1962) directed by Otto Preminger. The stress of acting under the irascible, Teutonic Preminger made him physically ill during the filming, and would have a major impact on his professional future. After viewing the film "Rosemary's Baby" (1968) Tom Tryon was inspired to write his own horror novel. He morphed into the novelist Thomas Tryon; his first book, "The Other", was published in 1971 by Alfred Knopf., winning widespread critical acclaim. It was made into a movie in 1972, which Tryon both wrote and produced. He then gave up acting to write fiction full time. "The Other" remains one of the most influential horror novels ever written; it helped to inspire the young budding author Stephen King. After publishing numerous other successful novels, some of which were also turned into films, Thomas Tryon died in 1991. I am pretty sure that the bus loaded at the 'back porch' after school. The back porch was where they eventually built the gym. Love your blow by blow of the daily routine. You are jogging some old memories loose! This is fun... keep it up!